The longest-running PGA Tour event still being played at its original site at Colonial Country Club will happen again this year! Renamed the Charles Schwab Challenge, the tournament will be held May 20 – 26. Our annual preview luncheon presented by Ciera Bank is Tuesday, May 14. Get in on the excitement! Lance Barrow, coordinating producer and Lead Game producer, The NFL on CBS will be with us again and interviewing an exciting PGA Tour golfer. As the famous Ben Hogan said, “The most important shot in golf is the next one”. Reserve your spot today! BONUS! Each attendee will receive one Daily Ticket to the Charles Schwab Challenge at Colonial, May 20 - 26, 2019. -Individual seats in Open Seating - Once you register, you will receive a confirmation email if your registration was successfully completed. If you do not receive a confirmation email within three (3) business days of submitting your payment, please contact Monta Noe. -Sponsorship opportunity - 2019 Sports Series (2 events) Click the Register Now button to reserve yours online or contact Jennifer Vuduris at jvuduris@fortworthchamber.com or 817.338.3335. Sponsors must be a Chamber member. 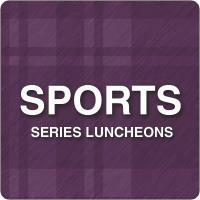 -TCU Coach Patterson Football Preview Luncheon (July TBA). A bit of Colonial trivia for you. Do you know why the 13th hole is so special? Hole #13 at Colonial Country Club has become one of the most famous holes on the PGA TOUR. Golfers must hit their tee shots over a large pond and hit the green just on the other side. However, the weather and wind might prove to have other plans for golfers...ANYTHING can happen on this hole. With the large trees surrounding the green as well as concession stands, shopping, and restrooms nearby, it is easy to see why this hole is so unique and popular with spectators and sponsors alike. - Returning email invitation with check to: Fort Worth Chamber of Commerce, 777 Taylor St., Suite 900, Fort Worth, TX 76102. Please notify Monta Noe if you are sending a check with name(s) of attendee(s) to ensure they get registered before the event is sold out.